Thermatech Northwest has the experience, training, and equipment to protect you and your environment from the hazards of all dangerous asbestos materials. Using the latest equipment, advanced protocols, and fully qualified technicians and AHERA Certified Building Inspectors, we can successfully meet your legal, health and safety requirements. Thermatech Northwest has extensive experience with asbestos abatement ranging from small residential jobs to massive public and commercial abatement projects to include federal government. Our work includes private, residential, commercial, and municipal projects, and we have successfully completed complex projects for health-care facilities, schools, military bases and college properties. We have the manpower and facilities for demolition, removal and proper disposal of pipe, duct, boiler and other insulations, sprayed-on fire retardant and sound insulation, floor and ceiling tiles, panel boards, and other asbestos-containing products. All work is performed under the guidance of OSHA, WISHA Certified supervisor in full accordance with OSHA and EPA regulations. Thermatech Northwest manages asbestos abatement from start to finish with the safety and health of people and the environment as their number one priority. We hold numerous licenses and certifications relevant to asbestos remediation, verifying that we can safely complete all the steps involved in your asbestos removal, including secure waste bagging and disposal. Our qualified teams follow all OSHA, WISHA, EPA, and state accepted work practices, and ensure all necessary permits, notices, and other necessary documents are secured and compliance regulations are met. Our abatement includes the strictest industry protocols to control any hazards posed by the presence of asbestos. This includes special measures to seal off the work zone with barriers and decontamination enclosures to ensure that any asbestos fibers disturbed during the removal process do not travel to other parts of your property. By utilizing negative air filtration systems, wet methods, and HEPA filtered vacuums, we minimize fiber release and maintain a clean project environment. Abated materials are packaged and dispensed, according to local government regulations. 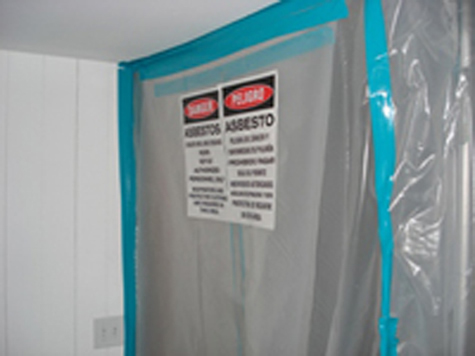 Asbestos abatement projects are highly regulated and require thorough documentation. Thermatech Northwest makes sure that each client receives a complete closeout package upon project completion. All pertinent documentation compiled during the project is provided for both customer peace of mind, and to help protect all parties from future liabilities. Project notification to all regulatory agencies involved. Certification verifying that all regulations were followed through project completion. Documentation of all licensing and training certificates for on-site personnel. Documentation of all Insurance coverages, including lead, mold and asbestos abatement. Certification that waste was transported and disposed of properly at an EPA approved landfill. Air sampling reports documenting conditions before, during and after the project. Throughout our many years of service, Thermatech Northwest has focused on complete customer satisfaction. We have worked hard to establish an excellent record of quality workmanship by delivering a professional, efficient and above all safe approach to hazardous waste removal. Preferred Asbestos Abatement Selected Contractor for Many Emergency Projects. We have an excellent working relationship with several consultants, large restoration companies and government JOC, MATOC, SABER, and IDIQ contractors, who routinely contract with us to deliver asbestos abatement and removal services. We are proud to work side-by-side with our customers and their insurance providers, to provide safe, professional hazardous waste removal and emergency response services. All of us here at THERMATECH NORTHWEST, INC. look forward to the opportunity to work with you. Call us today at 425-562-4556 or 253-984-1818.